We raise Angora goats for spinners' flocks & pets. Because we no longer show goats we do not register our goats. All of our does have been born on the farm are are from registered stock. We buy registered bucks from out of state to increase the gene pool in Maine. We have some doe/kids combinations for sale and ready to go to new homes in mid-May as we gradually reduce our herd. Kids will be weaned and ready to go to new homes the end of July. We will do discounts for starter herds that include does or does and their kids and unrelated yearling bucks ready to breed in the fall. Any out of state sales require a health certificate, some states require additional testing for the importation of goats. These additional costs are at the buyer’s expense. If you are interested in buying animals please contact us to make arrangements for a farm visit. All adult goats are current with CD&T and have official USDA tags. A 50% deposit will reserve goats for later pick-up. 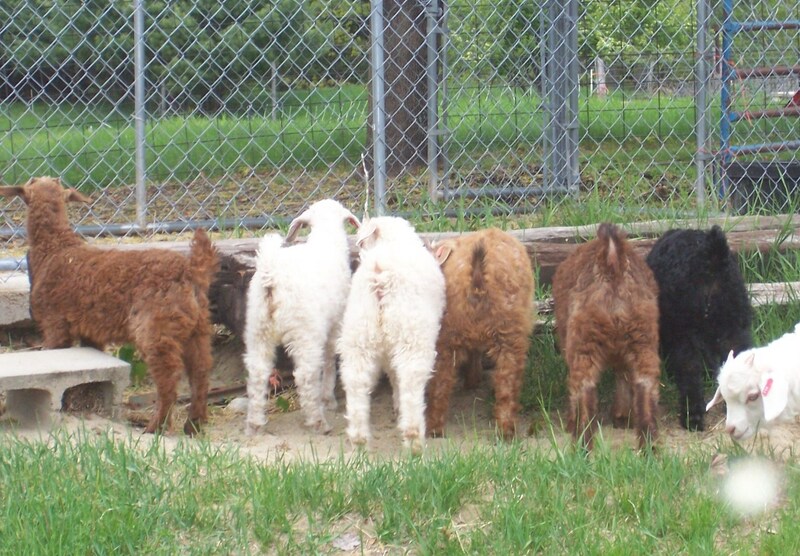 Our Colored Angora Goat Breeders Association Herd ID is FFF and our USDA Sheep & Goat ID is MEX 0020. If you acquire animals with these ID's we are the flock of origination and can provide you with additional information about the animals. i.e. companion for a single animal (sheep, goat, horse), or breeding bucks.